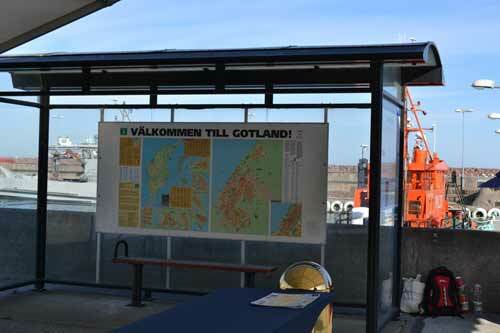 Cruise Port Guide Visby - Sweden: port map, cruise dock information etc. 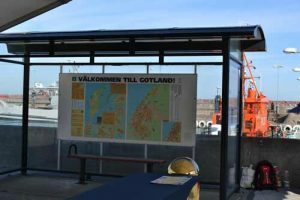 Our Visby cruise port guide gives you information about the docking location, cruise dock, transportation options and much more! 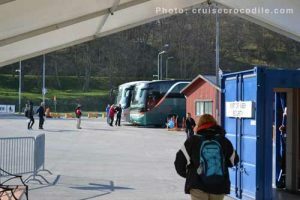 Welcome to the Visby cruise port guide. Visby is the port of call on the island of Gotland, which is the largest island in the Baltic Sea. It lies approximately 60 miles off the coast of Sweden. 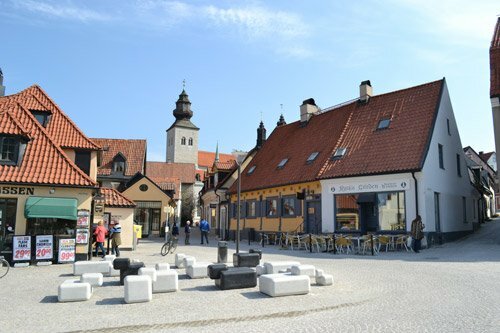 The town of Visby counts roughly 24.000 inhabitants and is well known for its historical value as a Hanseatic member in medieval times. Imagine this was one of the most important trading ports in Northern Europe where the pelts from Russia would be traded for fish from Norway or sheets from Belgium. Visby was the spider in the web of this huge trading network called the Hanseatic League, which was the European Union of its time. Today Visby is listed as a UNESCO world heritage site because of its beauty and educational value. This gorgeous historical town is still surrounded by its 3,4 km / 2,1 mile long town wall which encircles many church ruins, lively squares and unique remains of glorious medieval times gone by. Read the Visby cruise port guide underneath to see where your ship will dock or drop anchor. This is Visby’s cruise tender pier. Large ships (<400 passengers) have to drop anchor and tender you to shore. Shore excursion busses will be waiting for you on the dock. There are limited facilities at the dock. There is an information board and there might be some tourist maps available. The historical town of Visby is close to the port. It is just a few hundred yard walk along the waterline. 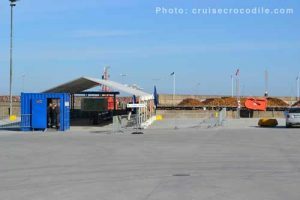 Only small cruise ships (under +/- 400 passengers / 24.000 GRT) can dock in the port of Visby, but generally the port has no dock available large enough for regular cruise ships. Therefore most ships will need to go at anchor and tender you to shore with their life boats. See map above where the cruise dock and tender pier is at. Both are close to each other. There are limited facilities in port. There might be some tourist maps available and that is just about it. 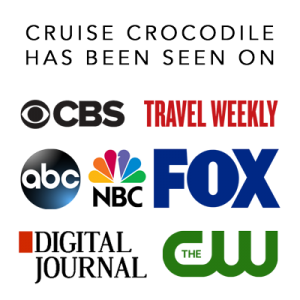 The tourist information is a short walk away from the cruise dock though. See its exact location in the port map above. Visby is best explored by foot although you could also use the local trolley train or taxi to get around. Read more about your options underneath. The old town of Visby is a must see. It is a short walk of 1 km / half a mile from the tender pier to the historical town. When you walk off the tender platform you will have the old town of Visby to your left hand side. If you follow the waterline along the port you will have the centre right in front of you. Since the city centre of Visby is such a short walk from the cruise dock there is usually only a handful of taxis waiting for you at the port and we highly recommend you to book one in advance if you are interested in doing a taxi tour. A taxi for max. 4 persons costs 500 Swedish krona (+/- 52 euro / 56 USD) per hour. A taxi for max. 8 persons costs 700 Swedish krona (+/- 74 euro / 78 USD) per hour. It is a great way to explore the island without a shore excursion. Rent a bicycle for about 14 euro a day and explore the island with the wind in your hair! 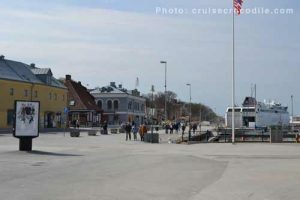 Close to the port you will find Destination Gotland AB where you are able to rent cars, bicycles, motorcycles and mopeds. Find the exact location of this rental service in the map above. Whenever a cruise ship is town there is typically a little tourist train waiting for you in port. It gives tours of about 30 minutes through the old town of Visby. The cost is about 65 Swedish Krona or 8 euro per person. Visby is currently building a new cruise terminal, although it won’t be finished until 2018. More information will follow.